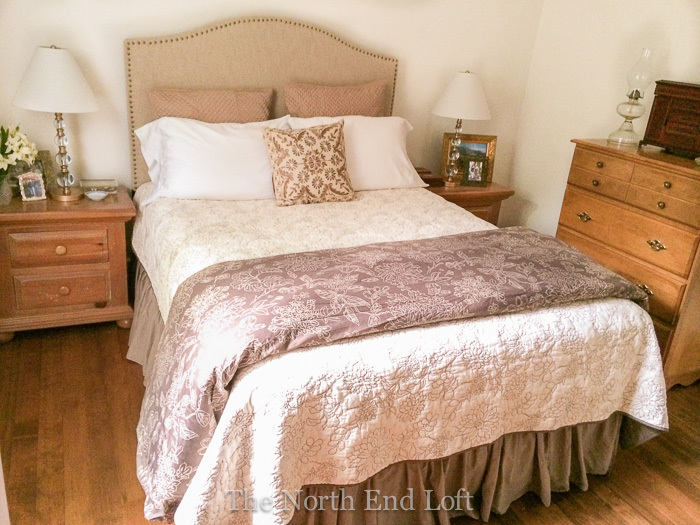 Today's the day for our new master bedroom reveal! The new white walls and refinished original wood floors create a neutral backdrop for easily changing to almost any look, by simply changing the bedding and accessories. 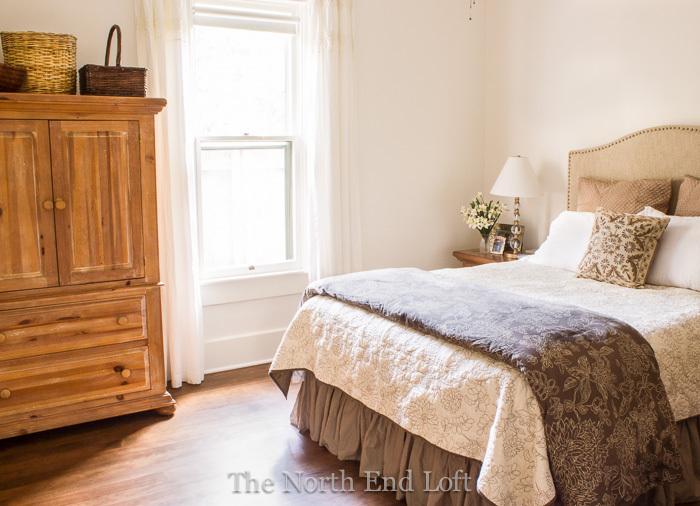 Even knowing that new lighter paint would make a huge difference, it didn't prepare us for how light and airy our bedroom feels now. 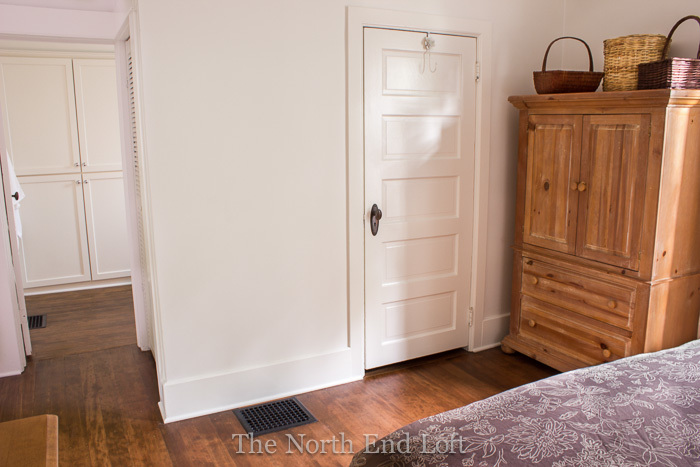 Our soaring ten and a-half foot tall ceilings also help our small bedroom seem larger and lighter than it really is. We accentuated the high ceilings, while also making the most out of our one small north facing window, by hanging our new curtains higher and wider than the window trim. The door on the right leads to a small walk-in closet, and on the left is our master bath (See the master bathroom reveal here.) We've been loving the bare wood floors during our hot summer (so cool on bare feet), but I'm hoping you can all help us out with ideas for rugs. We don't know if it's better to have one big 8 x 10 rug that goes under the bed or two smaller rugs on each side and another one at the foot of the bed. I'd love to hear your thoughts and experiences with both. We downsized to a queen size bed and love the extra room it gave us for another small dresser. We also purchased a new headboard. It's so nice to lean against something soft while reading in bed now. I've decided to go slow with finishing our master bedroom decor. Since we're saving up for a few other large projects, the decorating must be done by me, and on a shoestring. (My favorite way, of course!) I have many plans floating around inside my head, like painting this dresser, and I'll be sure to share all my projects with you. To that end, my first bedroom project was redoing our old guest bedroom lamps from chrome to gold (see the tutorial here.) I'd love to buy new drum shades in linen or burlap, but recovering these instead is one of those future projects rattling around inside my head. 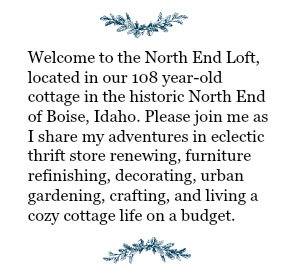 As for furniture, I won't be painting our pine bedside tables and armoire for sentimental reasons. Do your remember when this style was advertised in just about every issue of BHG and Country Living? 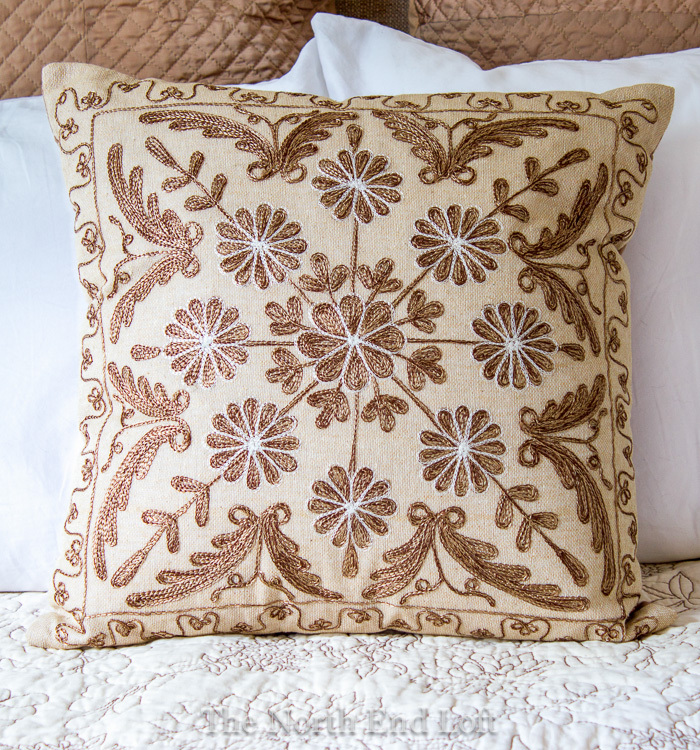 I borrowed this pillow from the guest room for now, but I have plans for sewing a long bolster. 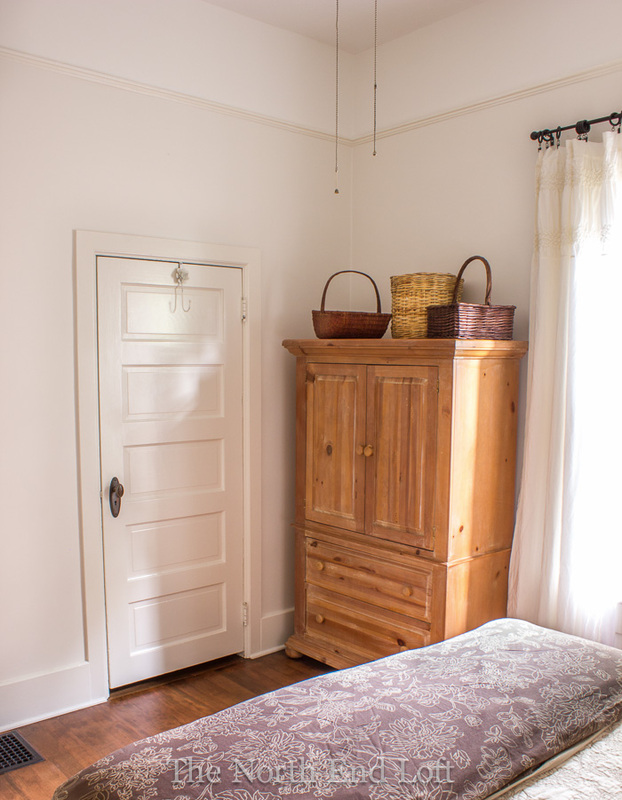 We love our heavy pine armoire. It fits this wall perfectly and holds so much! Our new curtains are lined white cotton panels with soft gathers and ruching at the top. 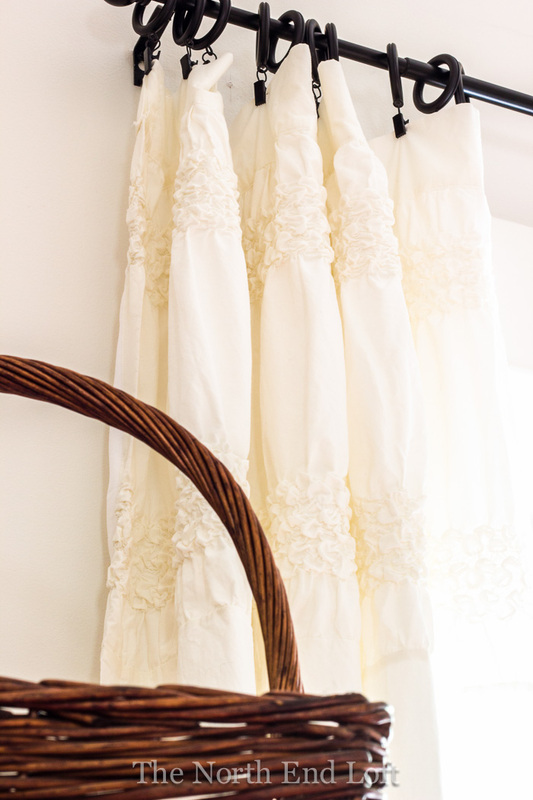 They were simple enough for my farmhouse look with just a touch of feminine detail. 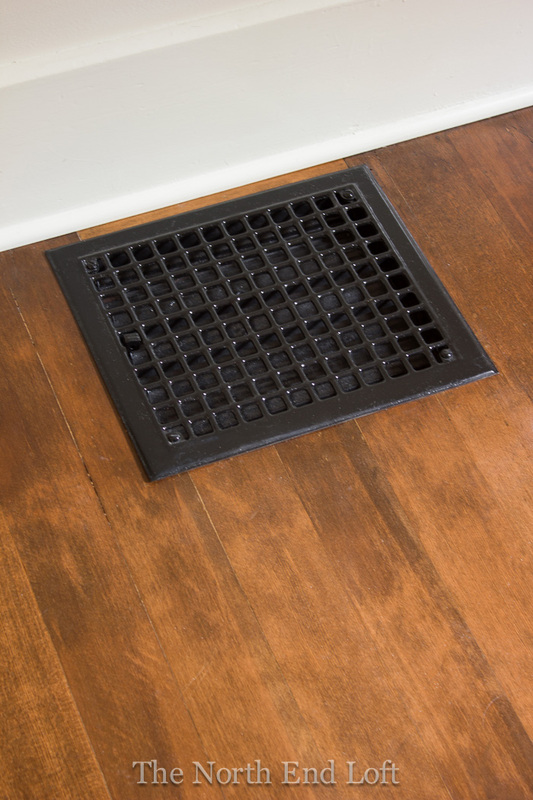 Here's a close up of the Minwax Special Walnut stain on our old Douglas Fir floors with our original antique (scrubbed and spray-painted) heat register. That's our master bedroom so far, with lots of plans still in the works for decorating. Thank you so much for stopping in today to take a look! It must be time to party! What a gorgeous room!! I LOVE your pine furniture and love how it stands out in the room. Those ceilings are amazing as are the doorknobs:-) Love the new light color too. We lightened ours up as well, and what a difference it makes. Beautiful room!! Wow, I am loving your master...what a nice space to relax and read. You did a wonderful job....just wonderful! I can't believe how light and airy it looks now; you guys did a great job! And I don't blame you one bit for not wanting to get rid of the old register! Your bedroom is so light and airy now, Laurel! I love your high ceilings and the fact that you have a master bath in an older house is wonderful! I don't have any rugs on our bedroom floors yet and I kind of like the ease of swiffering without having to move rugs. Enjoy your beautiful rooms! It looks great, Laurel! I agree that your foundation is now set so that you will never go out of style and can do quick changes with bedding and accessories. Love your headboard! I think I have the same armoire as you. Mine was the natural pine at one time, but I painted it black and added a couple of wood embellishments to the doors. 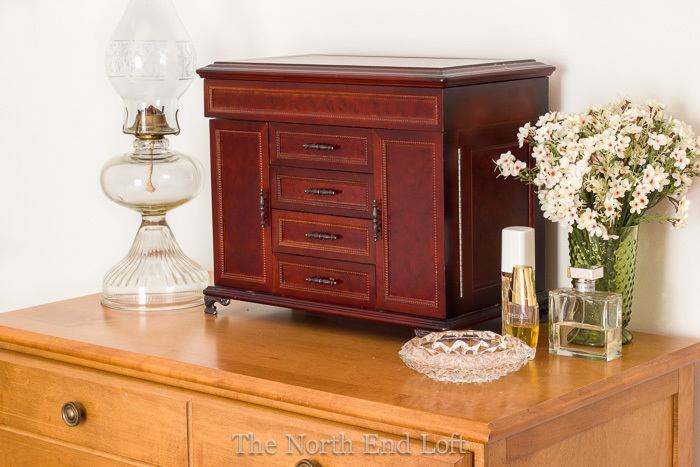 We use it in our guest bedroom for storage and to hold the television in there. Laurel, you two have really done a remarkable job with this transition! it looks marvelous- what a gorgeous beautiful space. Congrats and well done, ma'am! Oh how beautiful and relaxing Laurel! 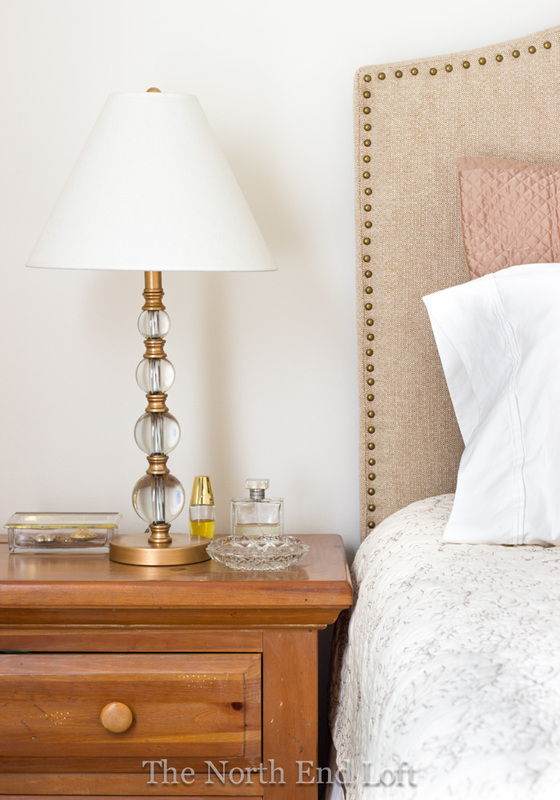 The neutral shades make it feel so light and airy. Those floors are gorgeous - yay for keeping the register. The headboard and curtains especially caught my eye - so pretty! 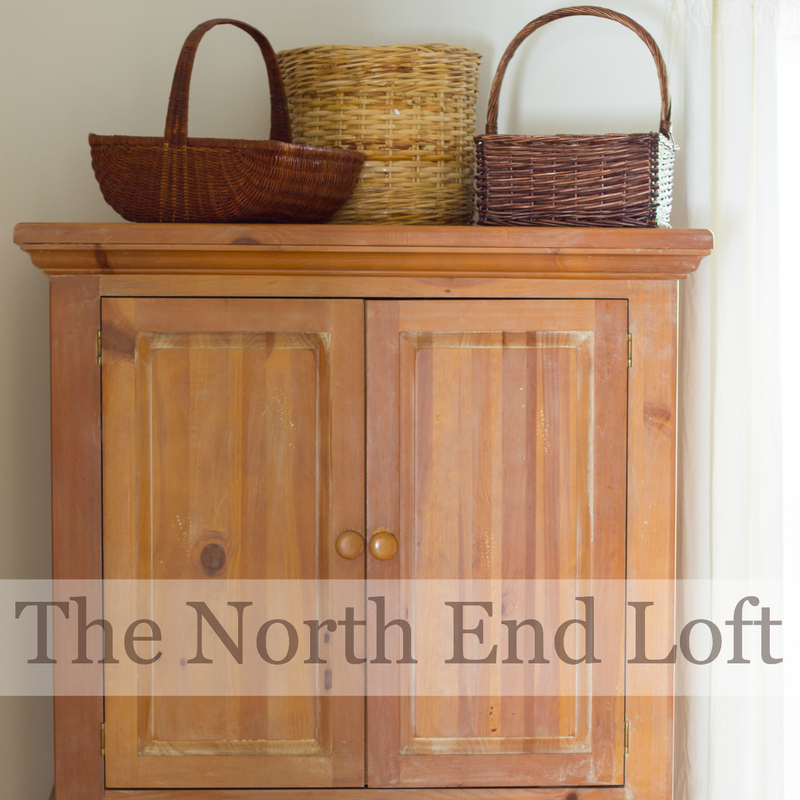 And as much as I love painted furniture, I think the natural tones really suit your home and the farmhouse look. I wish you many nights of sweet dreams! Everything looks so fresh and open. 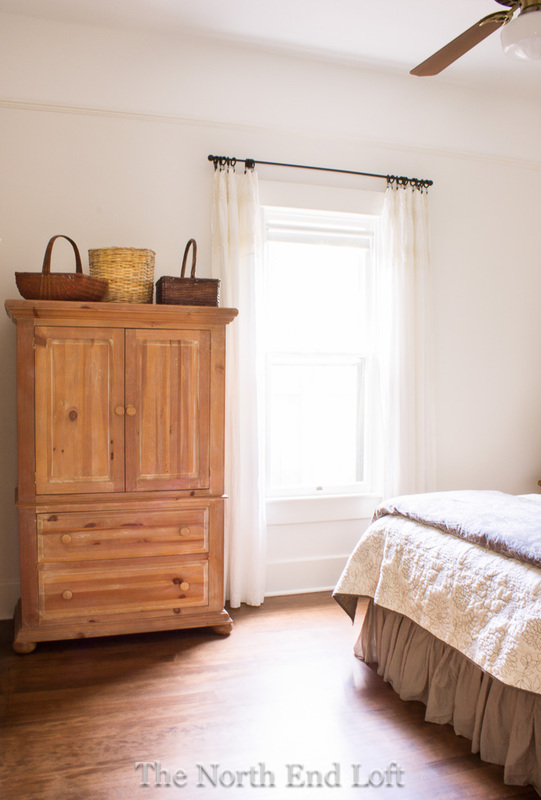 Love the baskets on the armoire and those floors! Girl, that's just lovely!! WOW!!! Quitw a dramatic change and all for the better! Great work!! Enjoy it! I'm a new follower of your blog and have been inspired, already! What a lovely bedroom you have created. The simplicity and soft colors are relaxing--may you rest well there. As for your rugs, I suggest you consider going with rugs around the perimeter, rather than a single, large rug. It gives you the chance to play w/variations, plus, I found it is so much simpler to clean under the bed that way. Laurel, your room is amazing!!! Love the bedding, the drapes, the wall color... Everything is just gorgeous! What a change! We recently ripped up the wall to wall carpeting that was in our bedroom and I have rugs around the perimeter. I couldn't figure out what size to use, either, and all the rugs I was really in love with cost more than $500 for the size I needed. I spent under $150 for three rugs (I have two runners and one rectangle) and I love it. It's SO much easier to clean under the bed now than when we had carpeting under there. I put a microfiber cloth on my Swiffer (it just pushes into the little dimples that usually hold a Swiffer pad) and it takes about a minute. I'm looking for some thicker, more Oriental-rug-ish rugs to switch out for winter, now. Hi Laurel, your master looks beautiful. You two did an amazing job with every detail. Such a peaceful and relaxing space. I love the neutrals too. It is perfect for quick changes with pops of color. Love it. It looks wonderful Laurel! The wood floors are amazing and I love the ruffle on the curtains...way to go! 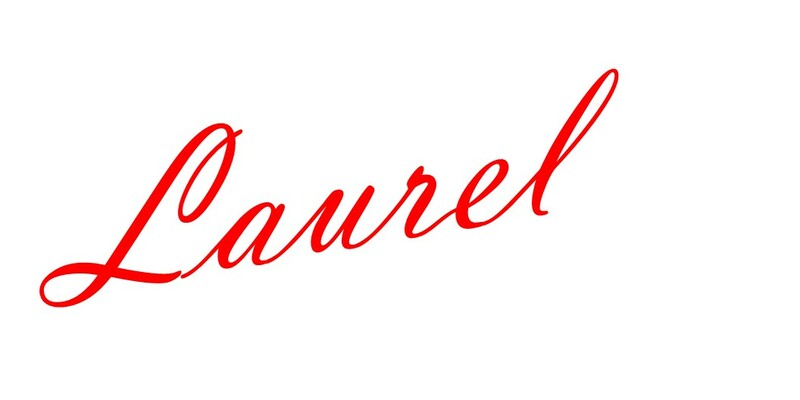 Laurel, great changes and can't wait to see the painted furniture and the colors you choose. Love the bedding and the floors. I think you absolutely nailed it all Laurel! What a peaceful and beautiful room!!!!! Love it! Beautiful room, Laurel! You must be loving it. Your curtains are really pretty too! Love it all! Your bedding is so pretty. You are right - the light color makes the room seem big and airy. Don't we all want that? I love everything about your new master bedroom. 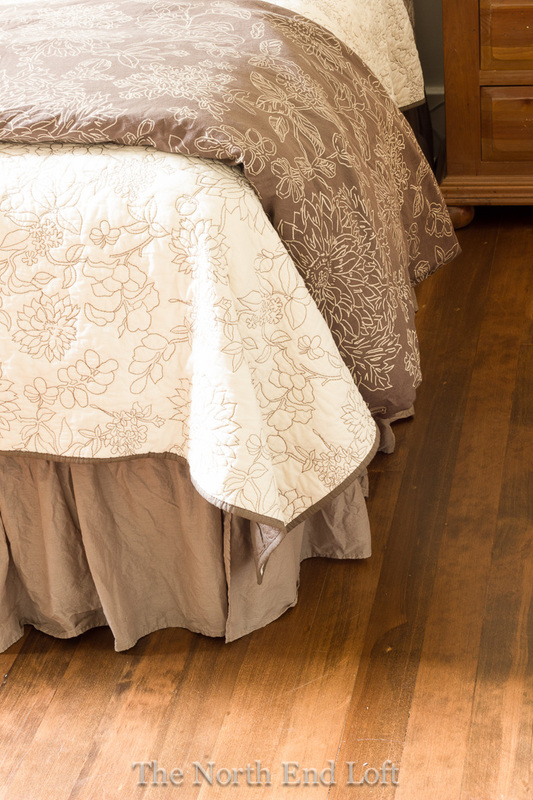 I think the curtains and bedspread are my favorites...oh, and the floors too, I love the floors. Thanks for sharing at Vintage Inspiration Party. Beautiful!!! I love the white walls, wood floors, and neutral bedding - did I miss anything? - because, you know, I love it all, including the wrinkly bed skirt look! Now I really need to paint over my blue walls! 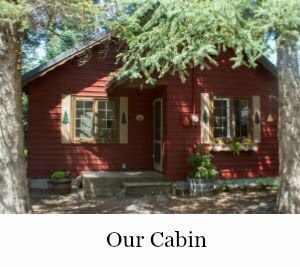 I dropped over from Cozy Little House and I'm so glad I did! 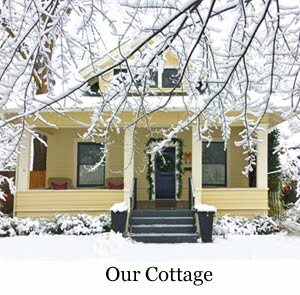 I love your style and your budget ideas. My husband and I also decorate on a shoestring and find it more gratifying to do things ourselves. When someone talks about going to a furniture store, I always laugh and say my furniture store is in my attic, with each piece waiting it's turn. On the bedroom rugs, in my experience, I think it would be easier to do a big rug than three small rugs. I'm thinking about ease of vacuuming and also just might be easier on the eye to see just one. 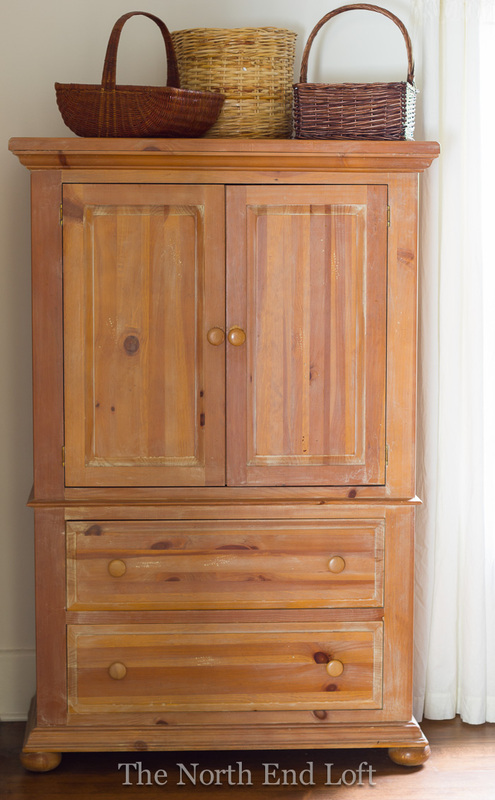 Does your pine furniture have a white wash? I painted a pine corner cabinet white and distressed and stenciled on it a couple years ago. Now seeing how pretty your pieces look, I'm wishing I hadn't. Or maybe I should have done a white wash. Anyway, love your bedroom, love the idea of never being outdated. You can't go wrong with white! I'm signing up to get your blog! Laurel, it all looks so lovely and bright. You've done an amazing job.